cost (when you consider that small eyeshadow brushes at MAC start at $60aud cost was a big factor). Then a few years ago I noticed that Manicare brought out brushes that looked professional AND affordable (starting from $6.95aud), and slowly slowy my collection grew. Most of my brushes now are from either Artiste by Manicare, Cosmetica by Manicare, or Models Prefer and none of them cost more than $20aud. As for what brushes to use on what part of the face, I don't necessarily pay attention to the rules and use whatever feels right. Like for example I have been using a lip brush to do my brows, and a bronzer brush to apply my powder foundation. I still mainly use my fingers when I apply liquid foundations, but when I do use a brush I use my Sigma Flat Top Kabuki which I wrote about first HERE. With face powders I generally like a big, soft but dense brush as you can cover a lot of area quickly and the denseness of the bristles give enough coverage without leaving a cakey feel. 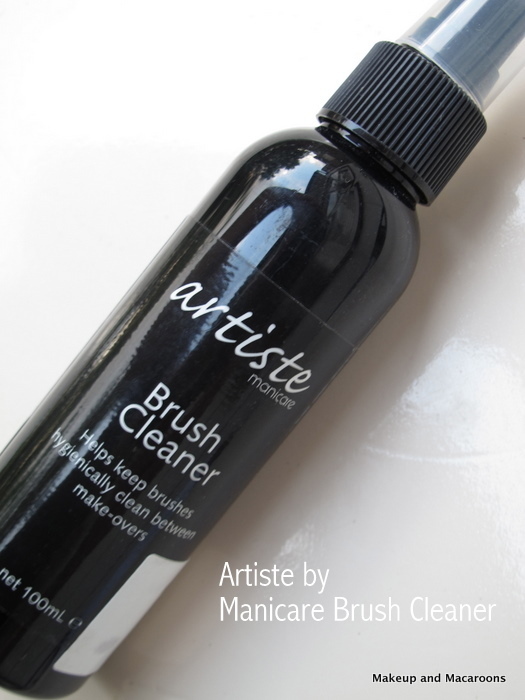 Lately I've been using Artiste by Manicare* bronzer brush as it ticks the boxes for me. For contouring I like a brush that's small enough to fit under my cheekbones, but also dense enough to deposit enough product and buff away the excess. My favourite so far is Cosmetica by Manicaresmall powder brush*. For powder blushes I've been using the angled blush brush by Artiste by Manicare for the last 3 years or so and I keep repurchasing when it gets too ratty looking, although lately they've been a bit hard to find so I think others have also discovered how good this brush is. For cream blushes I like using stippling brushes, and this Artiste by Manicare stippling brush* is great! For eyeshadows there are 4 types that I use. Blending brush - I've found fluffy brushes the best as they blend away harsh lines much easier than anything else. This one is by Revlon which I bought from a discount cosmetics store for less than $5 and I'll be going back for more. All over lid colour - Flat, dense brushes are best for pressing colour onto lids. The small eyeshadow brush by Models Prefer is my favourite which I've written about before. I have maybe 6 of these now including back ups. Crease - small rounded head brushes are great for cutting the crease. The one I use was a cheapo I bought from crushcosmetics.com.au. It's the Coastal Scents round crease brush. Highlight/inner corner - I prefer using brushes with a narrow tip so I can get a precise application and not mess up the rest of the shadows. This one is a smudger brush from a kit by Royal Langnickel that I received at IMATS. For my eyebrows I actually have been using a lip brush! I find that I can't work well with the traditional angled eyebrow brushes, but this lip brush from Royal Langnickel (part of kit) is small and firm enough to give a precise application. I hardly use brushes for lips, only if I'm applying my OCC Liptars as it's impossible to apply them with anything but a brush. I like retractable ones, or ones with a lid, as I can carry them in my handbag for top ups during the day. This one I use is from a Korean makeup store which I bought for a couple of dollars, but I know Manicare also make retractable ones. As for cleaning brushes, even though nothing beats giving it a good wash, I have been using this spray on brush cleaner by Manicare every few days to give my brushes a mini clean. Basically you just spray some tissues/makeup remover pads with the spray and wipe the brush back and forth on it. Easy! What about you? Do you have any favourite brushes? Were you as apprehensive as I was venturing into the wide world of brushes? This is a fantastic post, thank you! It's great to see a make up brush collection that has cheaper brands at reasonable prices, yet they still do what any high-end brushes do! My make up brushes are a bit of a mixture. I started off buying more expensive brushes (Napoleon & MAC), but after experimenting with Artiste by Manicare and Models Prefer I quickly realised that there is very little difference! I agree with you about using the brushes that feel right, not necessarily what they are ment for. Looks like you have a lot of great brushes! I also like using a stippling brush for cream blushes! I have that Models Prefer small eyeshadow brush and it's great :) I also have that Artiste by Manicare stippling brush, never thought to use it for cream blush though. It does shed quite a bit so I'm not too keen on it. I go between using my fingers and using a buffing brush to apply my foundation, both have their merits and I think fingers are perfectly fine, if not sometimes preferable to a brush for foundation. I love how you spend only less than $20AUD for a brush. I actually went and ordered my Sigma Brushes online the other day. It cost me $95 for a travel kit and 2 sigmax foundation brushes. I hope they're worth it - it's my first time getting good quality ones. So far I've been using brush sets from ebay, they get pretty flimsy after a while. I'm a bit too cheap to go out and buy the ones at the pharmacy. But I do sometimes use my fingers to dab on the foundation and buffer out with my MAC Stippling 180 brush that i was gifted. :) Great review! Will check out some of these manicare brushes as well, seen them around at priceline! I hope your travel kit works out well, $95 isn't too bad when you get a few brushes in a kit. It just seems such a waste to spend a lot of money on brushes, as if you're like me I'm sure you prefer spending the money on makeup instead. This is a great guide and extensive post! Love the pictures and ideas :) I use similar brushes for my makeup too. I really enjoy the Real Techniques brushes. They are awesome! Haven't tried Sigma nor Cosmetica, but both seems to be really good quality. Great post! At first I wasn´t very fond of the idea of using brushes because of the price and the fact that I didn´t know what to use for what, but now I can´t do my makeup without brushes :D I just LOVE Sigma flat top kabuki for liquid foundation. I think I can find artiste in Myer, but what about coastal scents? and manicare I think I saw it in BigW isn't it? I think great brushes make a real difference when applying make up, especially a good blending brush. And I also agree, they don't have to be expensive! Thanks for sharing this post! Definitely a great read. Loved how you broke it all down! I too, quite like the Artiste brushes! Before I got into makeup "seriously" I too used fingers, sponges and the occasional powder puff. But i'm pretty huge into brushes for most purposes now. Surprisingly, the brushes that most people tend to focus on (eye) are the ones I have the least experience with. Siiigh. Also I am intrigued by the idea of a lip brush for eyebrows. I must try this out!! very easy to understand! thank you! This is one very very helpful post. I bookmarked it, I know I'll keep coming back to it for guidance. Thank you so much! Please do more such "back to basics" type of posts! Belly update - 28 weeks!